- Set up this 3 team warmup by splitting players into teams of 4. - 1 ball per team. - Players pass within their group of 4 inside the area. - Players should all be in constant movement, with changes of pace to find space. - Diamond shape should be a focus to maintain good team shape. - Players should all be communicating with teammates, calling for passes, calling to the receiver of the pass. - Passes should be accurate, into space or to feet. - Players should not be bunched, nor should soccer balls hit each other. - This also builds great awareness. 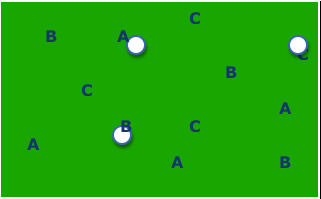 - Limit touches to 1 or 2 touch. - Add a passive defender that can defend any ball/team. - Allow defender to win the ball.